Farmer owned since 1909. The best taste every day. Natural cheese. 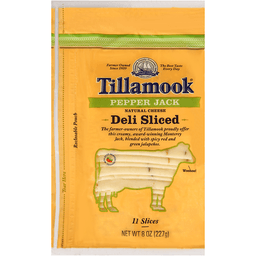 The farmer-owners of Tillamook proudly offer this creamy, award-winning monterey jack, blended with spicy red and green jalapenos. With diced jalapeno peppers. Woohoo! Reclosable pouch. Smile. You're about to eat Tillamook Cheese. What's in a Name? Tillamook is a Native American word for land of many waters. Most of the people who live here pronounce it till-a-mook. Our dairy cows, however, usually prefer to say till-a-mooo. Anchors A-Whey: In 1855, we launched the schooner Morning Star to carry fresh dairy products from Tillamook, Oregon up the coast to Portland. Now our cheese returns the favor by carrying a small Morning Star on each label. Hungry for Ideas? See how quickly Tillamook can make any sandwich amazing. Watch the mouth-watering video recipes at Tillamook.com/Kitchen. It's the best looking show not on TV. Made with milk from cows not treated with artificial growth hormones. The FDA has stated that no significant difference has been shown between milk derived from rBST treated and non-rBST treated cows. Please visit Tillamook.com/Contact. Contains no animal rennet (vegetarian). Thanks for buying Tillamook and keeping our family farms strong. Made with pride by Tillamook County Creamery Association.